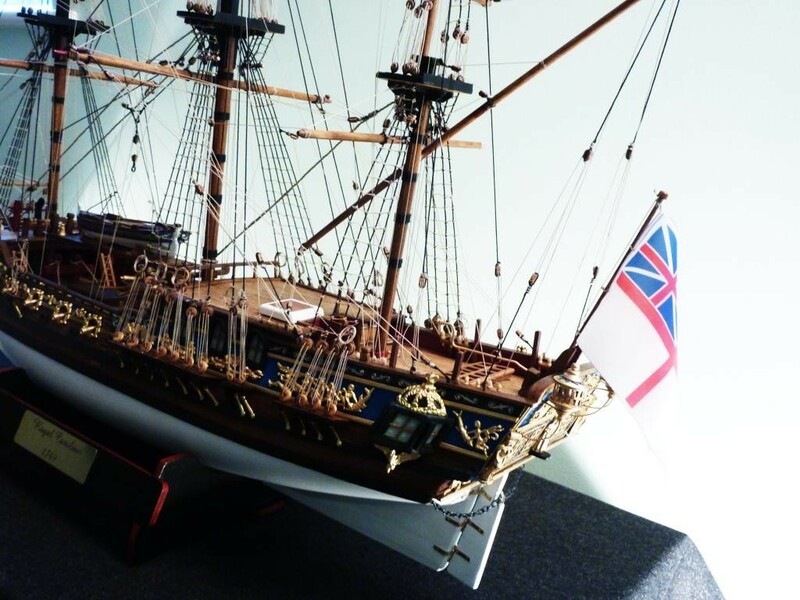 I’ve posted previous Headlines articles about this wooden ship model (Panart 1/47), as recently as a month ago, even though it wasn’t a completed project. This was because as a two-year, intermittent build, there wasn’t enough momentum for it to maintain interest as a WIP thread, but the ‘milestone’ sections when complete merited special attention for the detail provided. In the last posting, in early January, the masts were in place, leaving the yards and rigging to complete. Now, 180 hours of riggng time later, the project is finished. Although a longer-term project as mentioned, the actual build time, I see from my notes, was about six months; it seemed longer. Had I realised at the time that on a difficulty scale of 1-5, the Caroline was rated a “4” (Intermediate to Advanced), I might have chosen a different, simpler, first ship model. I’ve certainly learned a great many techniques during the build, in many cases unfortunately after I’d already made an error that couldn’t be corrected! 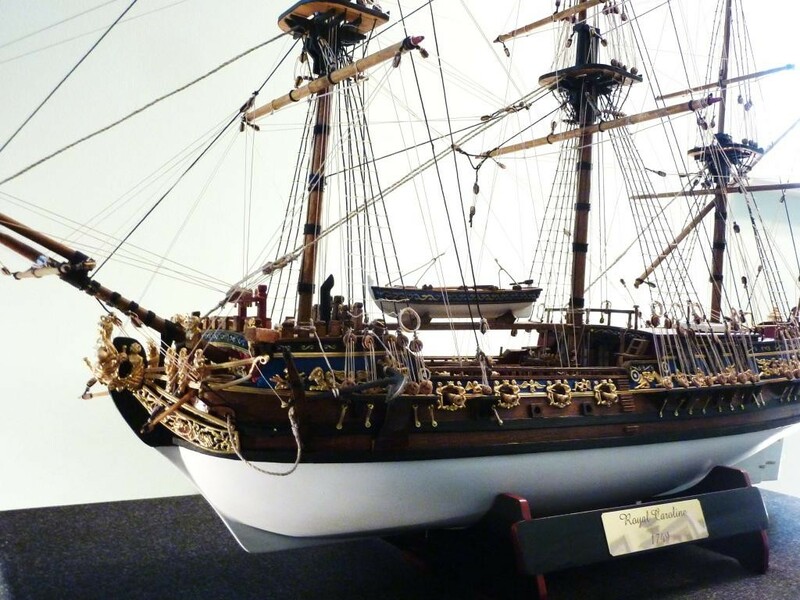 While not an example of model shipbuilding at its finest, it’s nonetheless decorative. 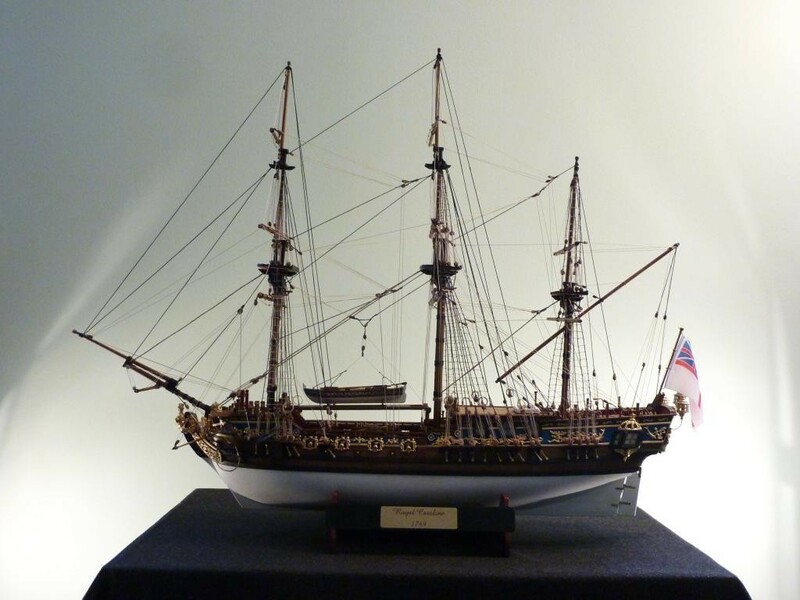 Since completing this build and article I’ve taken delivery of the ship’s case and have added one further photo of the Caroline in its new ‘home’. Stunning Rob, after all those hours working on her she stands proud. Amazing feat of modelling Rob. I’d never have got past all the rigging! Well done. Thanks, Gregor. By the time I reached the end I’d learned a few tricks to make things easier, but it’s still a LOT of rigging – a month’s work. Avast Matey! Tremendous result on a brave undertaking Rob. The rich colors on these sailing ships are a joy to behold. Cheers, Al. Oddly, a fellow modeller recently advised me that the rich finishes were ‘unauthentic’ and everything should be plain wood with a flat sealer finish. I’m sure he’s right, but I like variations. Anyway, too late now! Wow… that is one serious undertaking Rob. Fantastic job – heck, I’m afraid to rig RFC biplanes with twin flying wires… I would be seriously terrified to try that rigging job. Beautiful work! Cheers, Paul. 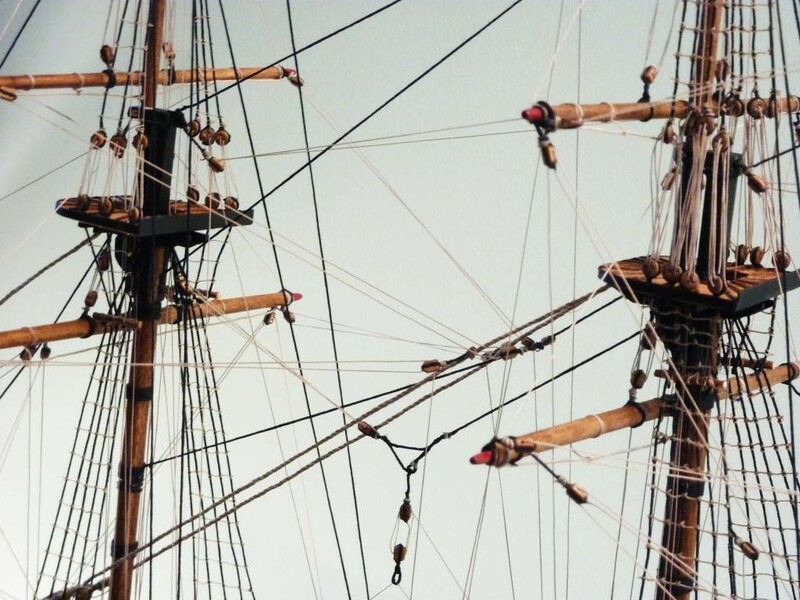 The rope ladders (rat lines) have black rigging thread running vertically with finer natural rigging line fixed at each crossing point horizontally. The finer line is held at these points with a clove hitch, each of these tied with a pair of forceps in each hand. Well… I can make a ‘flaws’ list a page long. Mind you, I only realised they were flaws after I had the chance to compare things to guys who’ve been doing this for twenty years, but I decided not to beat myself up about it and just crack on with the build. As with any modelling experience, you get out what you put in, however imperfect the result. Amazing, beautiful, superb. Well done Rob. I take my hat off to you on this one!!! Rob, I thought your 1:32nd scale Tempest was really nicely done-this Royal Caroline model is truly beautifully crafted and visually stunning-your time, patience, attention to detail and skill really paid off on her! Thanks, Erich. I did a 1/24 Typhoon – perhaps that’s the one you remembered. I appreciate your comments on both projects. That’s one stunning build, and just done a masterful job on the ringing. Cheers for looking in, Steve. Man that is fantastic, I so wish I had those kind of skills, well done! I don’t think there are enough wow words for this one. That’s a lot of rope. When me and my brother were kids we built some of these, I used to know some of the terminology for all the riggings, but forgot it all. Ratlines, maybe I could identify. Someday I would like to learn what it all does, but meanwhile your model is superb, museum quality, congrats. Cheers, Bill. I appreciate your comments. 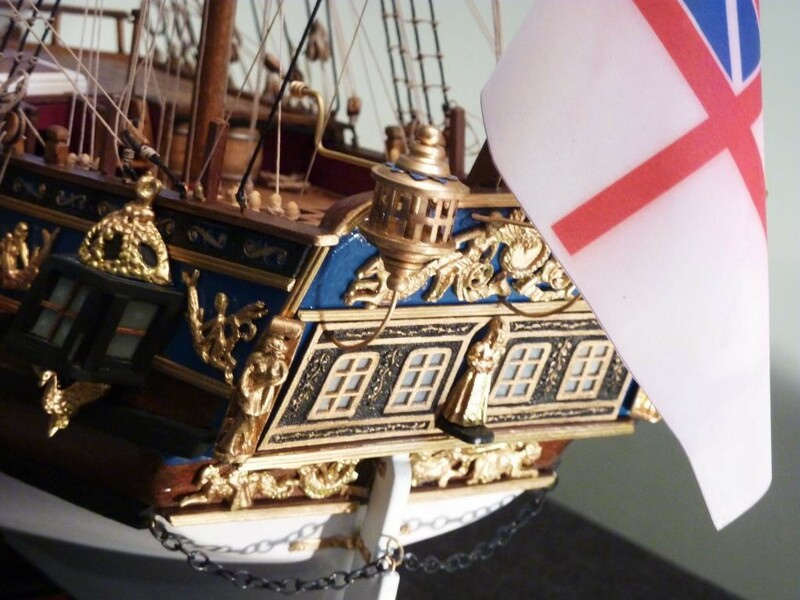 Alright, if you present the model to the Maritime Museum in Greenwich UK, they might say they have better ones. I, on the other hand, can only bow to someone who actually finished a traditional ship model with rigging and everything. Thanks, Ulf. 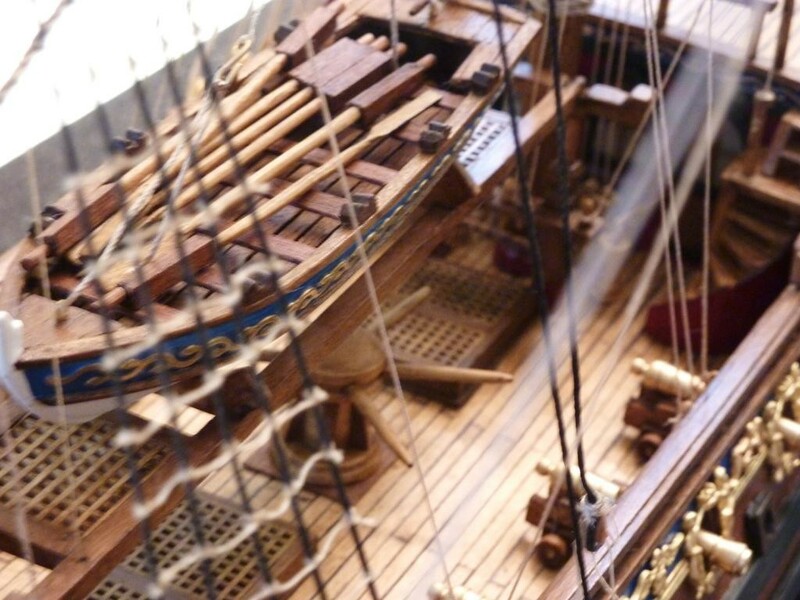 I was on a cruise ship a few years ago, and at various foyer areas they had professionally-built square-riggers (I believe scratchbuilt) on display, which no one but I seemed to notice, the quality of which actually put me off starting the Caroline, but I am generally pleased with the result. Who knows, after a few months I may think about another ship to take advantage of (and improve) my new skill set, but it’s a huge undertaking. The Caldercraft version of the bark Endeavour keeps batting her lashes at me but so far I’ve resisted the temptation. Rob, you’re in a class of your own. Josh, the rigging sessions were six to seven (working) hours a day, with a few minutes’ break every couple of hours, as your shoulder muscles and fingers begin to protest otherwise. I said earlier the rigging took 180 hours but it’s more like 180-200 in practical working time. I found that because of the nature, volume, and complexity of the work, if you didn’t press on with it, it was easy to feel a little overwhelmed with the job-at-hand. Rob, marvalous body of work. I’d say more but I just be repeating what’s already been said. Well done lad. You must be due some overtime pay, Rob, 180 hours in one month! You’ve completed a very attractive model, well worth the two year wait. and it would enhance any room, especially once you get the display case for it. Thanks, George. 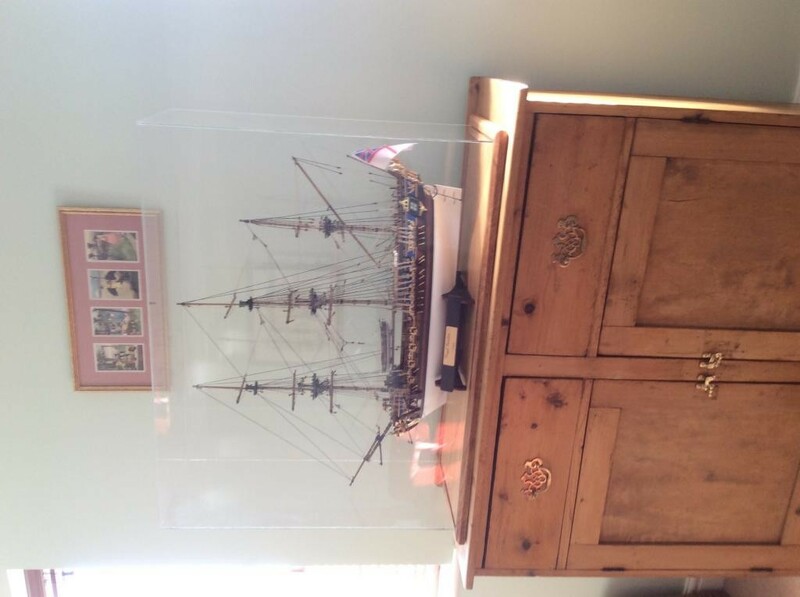 I’ve found a guy in Surrey who builds model cases including non-standard sizes for ships etc. He provides the case with its base covered in jeweller’s leather (choice of colours) at less than half the price of those often seen advertised in model shipwright sites, so will go with that in the near future. 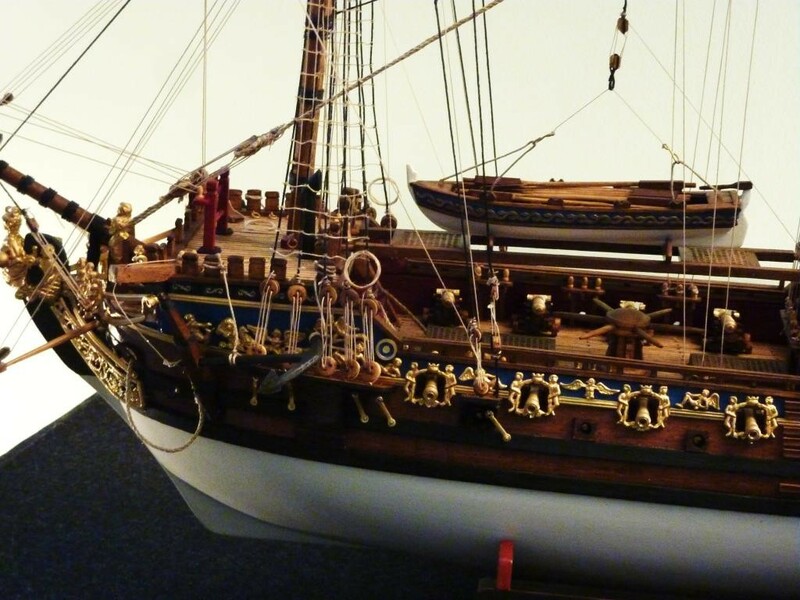 I can already see Lord Anson and King George III standing on the poop deck of this lovely and richly decorated yacht.Your rigging is very nice, I don’t have the time / patience to repeat it! Congratulations! Thanks. At the start of the build I copied images of parquet flooring with a compass motif on to clear decal paper and applied it to the cabin floors, naively thinking it would be on view in the finished model. 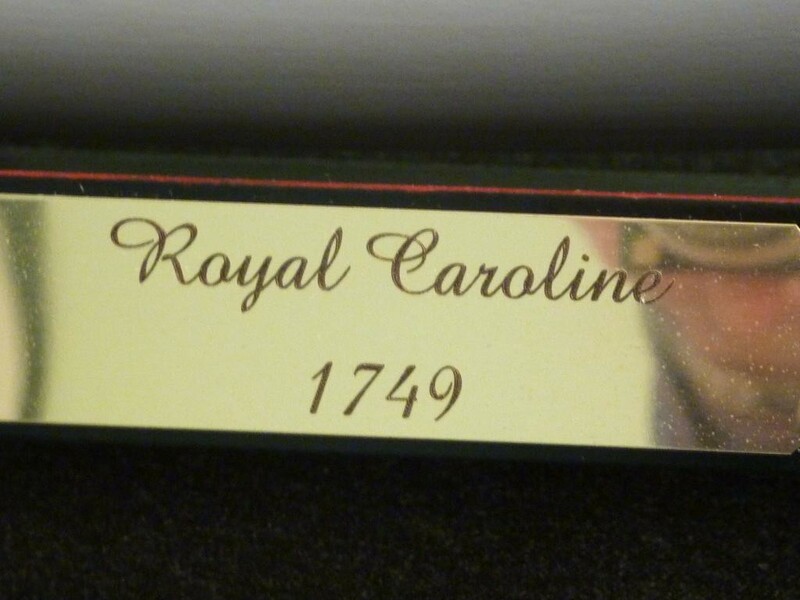 I also copied paintings of Queen Caroline into small frames and hung them on the walls. Ditto result. Very much true. My wooden shipmodelling experience thusfar were constructing a large tug (Zwarte Zee) and an small fishing boat: not a lot of rigging. I also didn’t bother for the interior.. So again: a lot of respect for your patience! I know the Zwarte Zee – a 1/90 craft from Billings? Nice model. I agree with Craig, Rob. 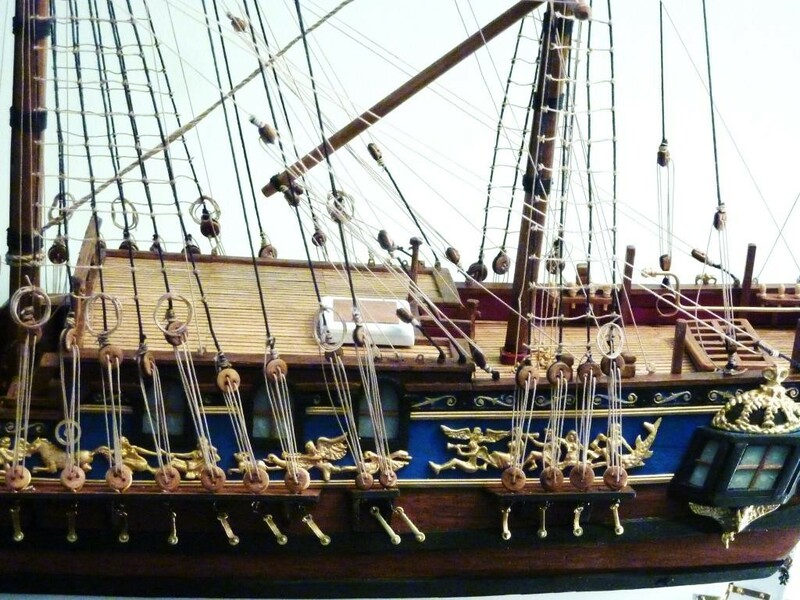 If you think this is ” not an example of model shipbuilding at its finest” I cannot imagine what “model shipbuilding at its finest” means to you. This is a tremendous accomplishment in all respects, of which you should, rightfully, be mighty proud! Thanks Ralph. It’s not that I’m dispappointed with the result, only that my views are tempered by the quality of other ship models I’ve seen, by those far more experienced than I in respect of this unique form of modelling. I like it, my wife (who has never commented on any other of my builds, ever) likes it, and my daughters have asked for the page link, so I’ve no complaints really, only that I’m highly critical of my own work, mainly to make myself do better next time! Thanks, Milan. Everyone’s comments much appreciated. 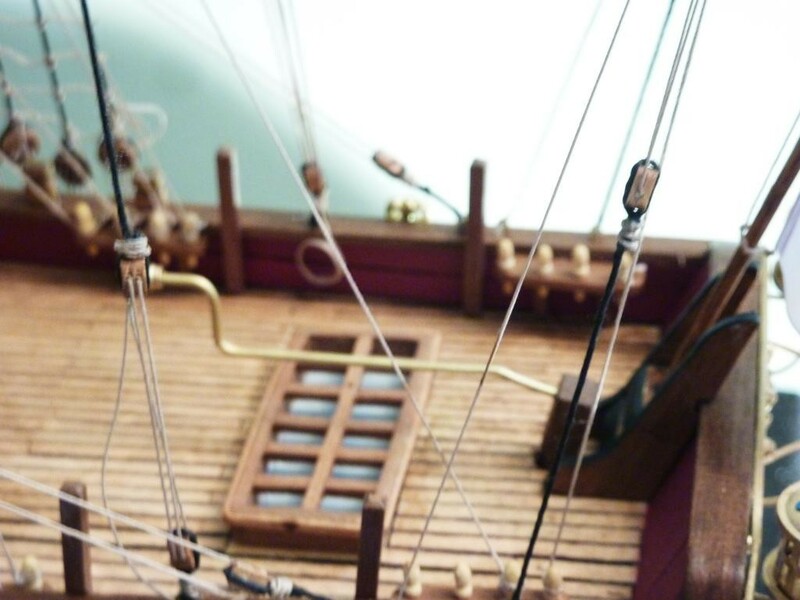 You’ve never really lived until you’ve built a sailing ship model….no one really appreciates all the workmanship needed in such an effort unless you put one together, either a scratchbuild or a kit. Wood is the ultimate medium to work in, unlike plastic the wood is waiting for you to “bring to life” an object that has no apparent form at first…bits of wood and grades of thread can be transformed by a skilled and determined hand. It’s a slow demanding task but very satisfying. The payoff is a real family heirloom, it will be enjoyed for many years. You nailed it Rob, your ship is a real “keeper”. I agree, Mike. 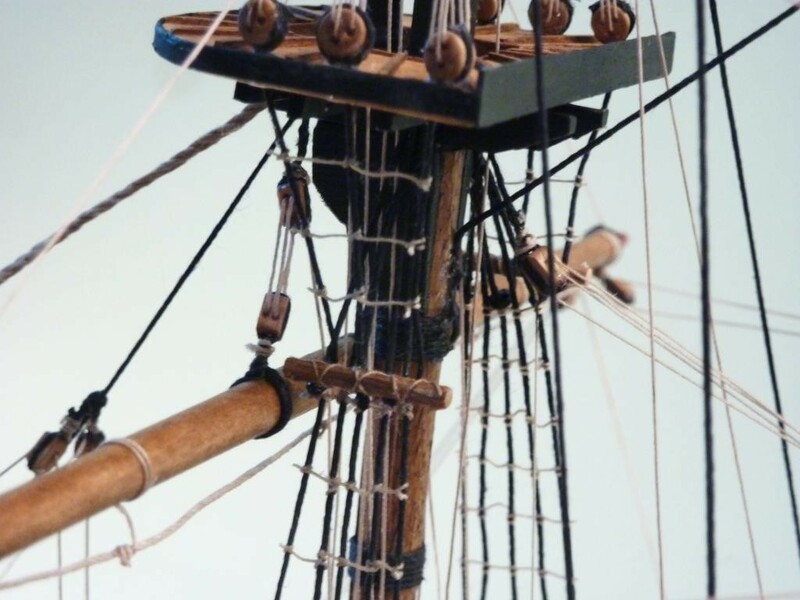 To take individual strips of wood in all different sizes and in various finishes that appear to have no relationship to one another, and create specific shapes from them that slowly begin to resemble an actual square-rigged ship, is something magical – also unsettling if your comfort zone is plastic. All in all, a positive experience, and one I might well revisit. Amazing Rob, it looks like you have put a lot of work into that! I wouldn’t know where to start with the rigging! 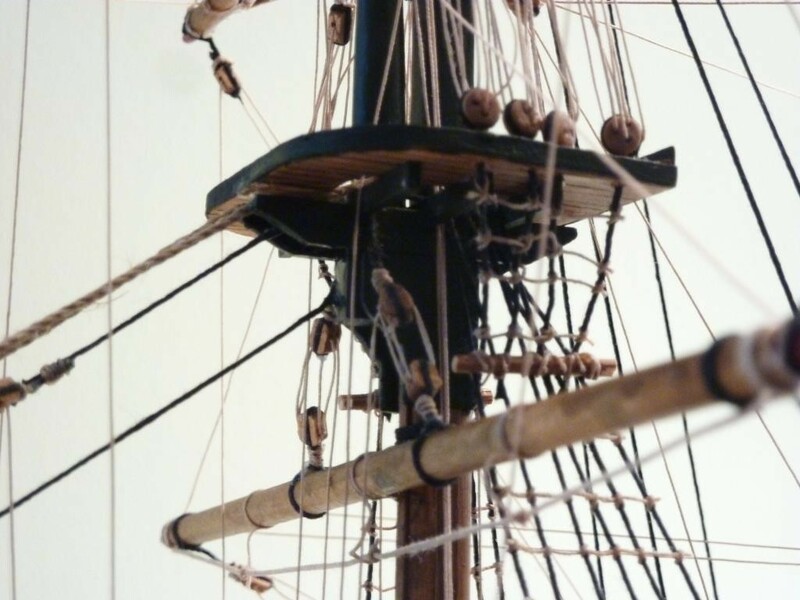 Me too, at first, but then I realised that you begin with the stern rigging, moving forward to the bow, and that the various standing and running rigs, and the knots, blocks, and deadeyes, are replicated throughout. In short, there’s a logic to it, as with the actual square-riggers. Oh right! That still doesn’t make any sense to me! But I’m a firm believer that you can teach yourself to do anything you put your mind to. Especially now we have you tube tutorials! 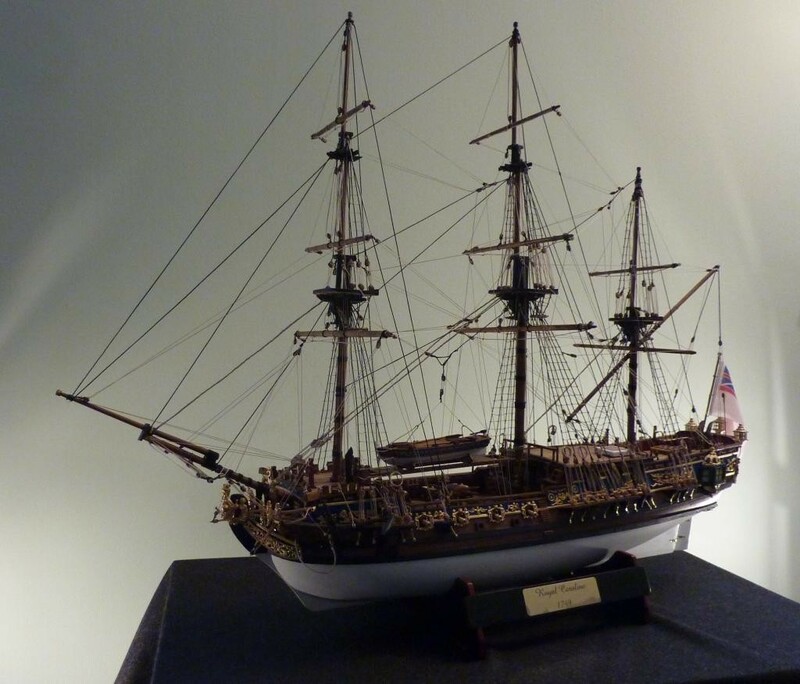 Thats an outstanding result in ship building, Rob ! 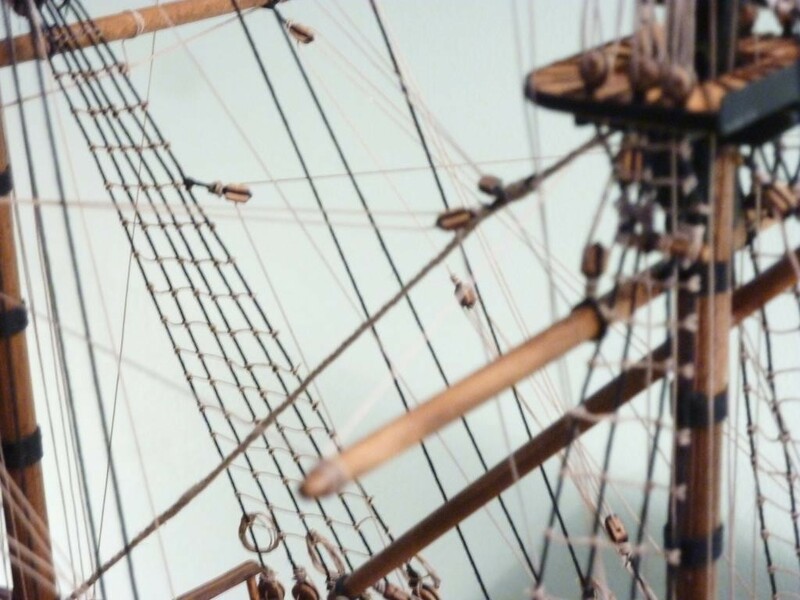 The detailing and the rigging looks great. 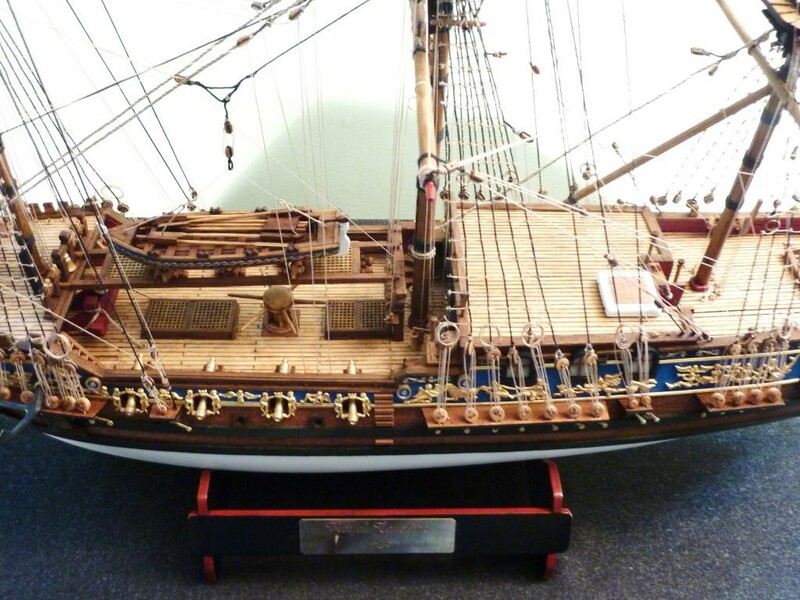 Love the ratlines, had always problems with them, while modelling sailing ships in the past.